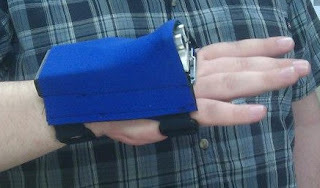 The BAT Sleeve is a nifty little device I made for my senior project in my engineering classes. It is a sleeve that fits onto a persons hand, and it collects info about the world and feeds it back to the user with vibrating pulses on the wrist. This by itself would be remarkably useless until you consider using it without sight. Now you can suddenly find your way around objects in your way, locate things as small as chess pieces on a table, and so forth. I came up with the idea soon after I arrived at the University of Southern Mississippi. It was there that I met Dorman 'Mac' David, the first blind man I have ever met. At the same time, smartphones were becoming popular. It clicked in my head that it was odd that everyone now carries these powerful computers, but blind people still had to navigate using a stick! With that in mind, I set about designing the sleeve. I think I must have driven poor Mac crazy asking him questions about how he gets around. I knew that I wanted something that could be close to the way he navigates already for him to use it easily, so I settled on creating something that acts a bit like a cane does. They will sweep a cane left and right, and when it comes in contact with something, it gives feedback. It was obvious that this had to be mounted on the hand somehow. It was clear that I have to have it 'fail-safe' for the safety of the user. I knew that the response time had to be FAST! Time to build a demo! My demo unit I was NOT proud of. It was a Arduino board that was rubber banded (yes really) to a fingerless glove. The slightest bump on this thing would make it die until I fixed it. But it was a proof of concept, and when it was working, it worked well! I used this proof of concept device in a video to raise money for manufacturing the PCB's and other components I would need. Sadly, being a starving college student means that sometimes you need to ask for help. Luckily, I was able to raise enough on indiegogo to be able to build my final project without resorting to selling a kidney. After raising the money needed for the project, I designed the PCB, streamlined the software a bit, and started work on tearing apart some medical wrist braces to see how they mount to their hand. My mother ended up putting together the fabric parts for me with me hovering over her in the most annoying fashion. Then I set to work soldering and assembling the components. Without to much trouble I ended up with a final project. My sleeve was then entered into the USM School of Engineering Design Competition where it won first place. I have to say though, the other projects people worked on were really neat, and I feel honored to have those students as my peers! After submitting my project, I learned about the fantastic project called Tacit. It is the same general concept as my project, only with some differing ideas. It is the work of the ingenious Steve Hoefer, and you can view it here. By all means, mix and match our designed to find something that works well for you! I have since graduated school, and have made the decision to publish my design. Beyond that, I am making a new, simpler design, that I hope anyone can make. I want to be like the painter Bob Ross, only with electronics and computers. Not just make wonderful things, but inspire YOU to do the same, and encourage you to modify and re-post your own wonderful designs. So tomorrow we can get started on making a happy little BAT Sleeve! Coming up tomorrow? The parts list!